Update: Ten months after we first saw Panasonic's 20-inch 4K tablet at CES 2013, the company held a launch event in Hollywood to show off the final product. It's undergone some changes since then, so we've updated our hands-on review to reflect that. Panasonic chose to roll its 20-inch 4K tablet into its Toughpad line, dubbing it the Panasonic Toughpad 4K UT-MB5. Since the first time we saw it, the tablet's RAM has been doubled to 8GB (with 2GB of VRAM). Its storage has also been doubled to 256GB, and its rear camera has been replaced by a front-facing one. In addition, the tablet's back and bezel now feature an attractive and eye-catching lined pattern, though the texture remains smooth. We've also learned that it runs Windows 8.1, has an optional Bluetooth stylus, and is designed to withstand a 30-inch drop to its back while operating and 12-inch drops at 26 different angles while it's turned off. Other than those changes, the Toughpad 4K UT-MB5 remains largely the same as when we first saw it back in January. It's still an enterprise business-oriented tablet geared at architects, photographers, designers, salespeople, and executives, and it still looks and feels gorgeous. The 20-inch Panasonic Toughpad 4K UT-MB5 tablet will release in the US in January 2014 for $5,999. 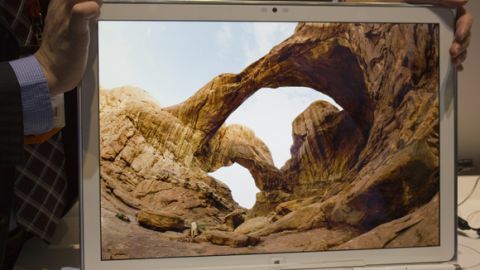 Panasonic introduced a uniquely massive tablet in its CES keynote on Tuesday, and TechRadar later got a chance to check out the prototype device in person on the convention floor. It's a thing of beauty, though it's certainly not for everyone. The tablet's display is 20 inches across with an Ultra HD 4K resolution of 3840 x 2560 and 230 ppi, which makes even the most minute details come out crisp and clear. To top it off, it runs a full version of Windows 8 Pro, though the Windows desktop (and several other functions) were not accessible on the prototype models at CES. But even the most tech-obsessed consumer is going to struggle to come up with justifications for owning one, a fact that Panasonic seems well aware of. In fact, the 20-inch 4K Windows 8 tablet is a professional-oriented device that won't be aimed at average consumers at all. Panasonic had the large tablet set up at three kiosks at its massive CES booth, each of which showed off functions for different types of professional: architects (using Bluebeam software), photographers (using Photoshop) and marketers. For marketers in particular, the 20-inch tablet will be meant to "replace paper," a Panasonic representative told TechRadar. Lying sideways, the device's 20-inch screen is roughly the size of two pieces of printer paper, and Panasonic referred to it as a "virtual brochure" that marketers can use to show off their wares and ideas. Panasonic representatives emphasized that the version of the 4K tablet that was shown off at CES is only a prototype, and that its specs are subject to change. But the device is currently packing a 1.8GHz Intel i5 3427U vPro processor, Nvidia GeForce graphics, 4GB of memory (though that will almost certainly increase, TechRadar was told by a Panasonic rep), a 128GB solid state drive, 10 point multi-touch, 720p video capture from the rear camera, and space for a microSD card. It's certainly got power; the Windows 8 OS, which can get somewhat laggy on lesser tablets, was as responsive as we've ever seen it, quickly switching functions without so much as a hiccup. But the 4K tablet's considerable 5.5 lb weight and massive frame, not to mention a rather paltry 2-hour battery life, will make it less attractive to consumers looking for a large tablet to carry around. Practically speaking, the 4K Panasonic tablet's considerable size and resolution presented some usability problems. Using Photoshop effectively, for example, was made nearly impossible by the prohibitively small size of the icons around the sides and top of the screen - despite the crispness of those icons (no complaints there) they were simply too small to easily tap with a finger. To top it off, the tablet refused to acknowledge the taps of the Anoto digital stylus that was tethered to it, only recognizing actions like swiping and dragging. That may be subject to change as well, though in this iteration the pen was ineffective. That said, another Panasonic representative assured TechRadar that application specific such as icon size will almost certainly be altered by the time the big tablet is ready for store shelves. The tablet's virtual keyboard, on the other hand, accessed through a simple menu, was large and responsive enough to use without taking up too much real estate thanks to the enormous screen. Until then, you'll just have to make do with your dinky 10-inch iPads.